I’m sure that we’re all aware of the concept of the multi-verse: a series of dimensions where time runs in parallel, but when a decision is made, it’s opposite of what happens in another dimension, and from their a new dimension is born. 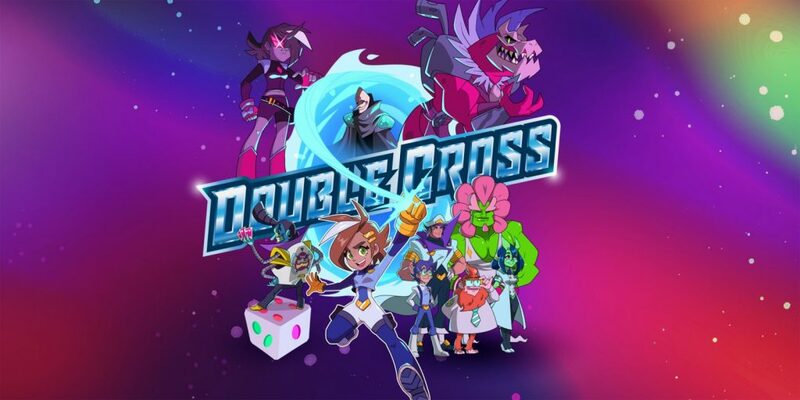 In Double Cross the RIFT agency are a collective of inter-dimensional police whose job is to go to these other dimensions and stop people doing naughty stuff. As Zahra Sinclair you’ll find the agency…double crossed right at the start of the game. A masked man attacks HQ but seems to have had help from the inside. So you’ll find yourself visiting three separate dimensions to gather clues, figure out who exactly it was that attacked and put a stop to their evil ways. If I’ve got you excited over the idea that this is some sort of inter-dimensional detective game I’m going to have to ask you to sit down partner, this is a 2D platformer, but it is at least an OK one. Double Cross is from the makers of Runbow, and in many cases this shows. The platforming action is as tight as it was with the multi-coloured jump ‘em up, with some OK scenery surrounding some devilishly good design. 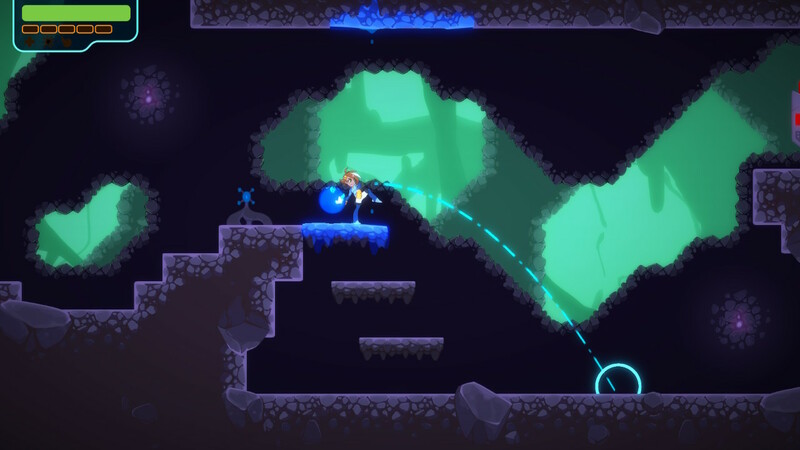 Zahra is equipped with a proton slinger (a grappling hook in all but name), which when aimed slows down time and allows her to grapple certain scenic objects. There are also some areas of the levels that are coated with different goods that give them properties like stickiness or slipperiness, and others with conveyor belts that not only run from left to right, but also up and down as well. 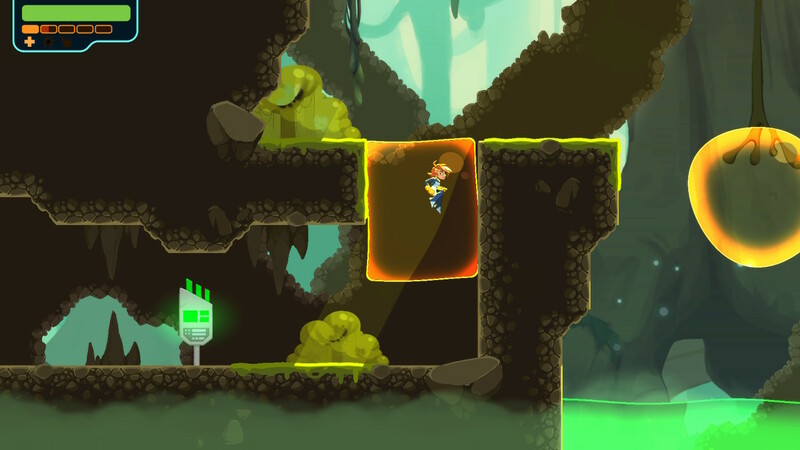 Now, I know that that pretty much sounds like every platformer that has gone before, but it’s how Double Cross melds these elements together that makes Double Cross a decent action platformer. There’s a section where you’re being chased by a giant goo monster that requires you to quickly use all the elements of Zahra’s moveset to jump, bounce, grapple, slide and grab extremely quickly or the enemy will get you. Or there’s the level where you’re moving between trucks in a giant dinosaur convoy and parts of the levels have no floor meaning you’ll need to figure out how to chain abilities together to get between sections, and that’s where the developer’s experience on Runbow comes in. If it sounds complicated I can assure you it isn’t. There’ll be times when you’ll fail again and again, and eventually get through, but those parts are few and far between, just like those moments I mentioned earlier. Yes, those bits are fun, but they just don’t occur often enough, and even if you do get stuck every now and then you’ll still find you’ll get through the game in around four hours. It’s a short game, and for the platforming to not be as consistently excellent as those bits I mentioned earlier makes the short run time even more disappointing. Even that detective element never pays dividends here. Completing levels gives you evidence that you take back to the RIFT HQ and then you need to show it to the proper character to figure out just how it solves the case. There are three cases, one for each dimension and then an overarching fourth case for the main story, but there’s no real figuring out to be done here. No searching for things yourself, or problems if you show the wrong item to the wrong person; you just keep going until the required person sees the object they’re supposed to. A shame, because I could have really got behind the idea of an intergalactic detective agency. 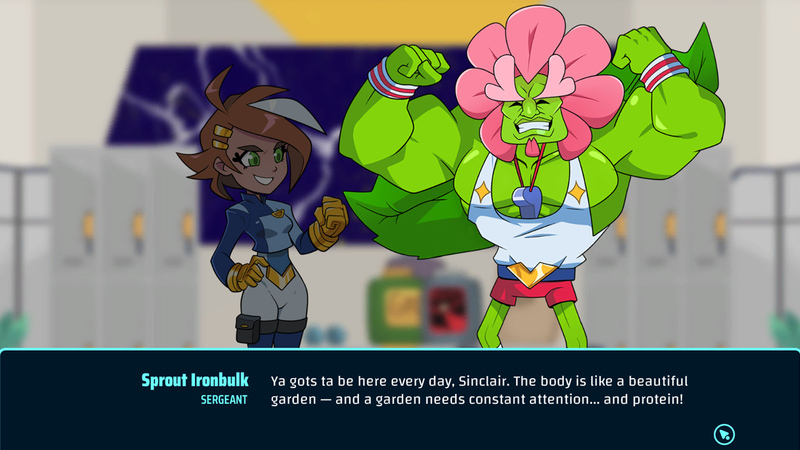 There’s a cute aesthetic, sort of like Megaman if it was designed by the artists behind Ben 10, with a good range of character designs (even if one of them does give away the twist right from the beginning), and the writing is good too, giving each character a bright personality that matches their design. Unfortunately a range of music that basically serves as more functional than anything else sullies things slightly, let’s just say you won’t really be wanting to make much use of the soundtrack selector that unlocks after you beat the game. I do wonder if I like this game more because I’ve come to it on the back of the dire Travis Strikes Again, but as far as I’m concerned it’s a decent little game, sort of like the platforming equivalent of Cat Quest. Does it have the best story? No. Is it without faults? Also no. But what Double Cross is, is something that you can get your teeth into like a palette cleanser if you have time between bigger titles. There’s not much here that’s going to set the world alight, but you will at least find there’re spots of fun to be had. More challenge would have been nice. Definitely not the best game, but definitely not the worst, at least you wouldn’t wind up being doubly cross after playing this.